For the first time, sophisticated U.S. military surveillance drones capable of carrying missiles have begun patrolling waters off Somalia in hopes of stemming rising piracy. Three ships have been seized in a week off Africa's lawless eastern coast and Vice Adm. Robert Moeller, the deputy commander for the U.S. Africa Command, said pirates continue to pose a significant challenge. With the monsoon season now ended, there has been a rash of attacks as pirates return to the open seas. More than 130 crew members from seven ships are currently being held, including about 70 from the latest attacks. In an effort to stem the surge, unmanned U.S. military surveillance planes called MQ-9 Reapers stationed on the island nation of Seychelles are being deployed to patrol the Indian Ocean in search of pirates, Moeller told The Associated Press in an interview at command headquarters in Stuttgart, Germany. The patrols began this week, military officials said. 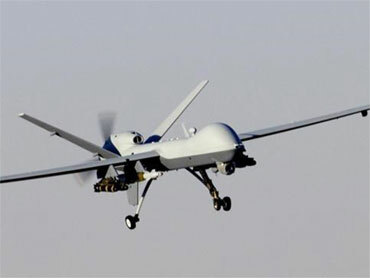 Analysts said they expected the Reapers would also be used to hunt al Qaeda and other Islamist militants in Somalia. While Moeller said the aircraft would "primarily" be used against pirates, he acknowledged they could also be used for other missions. Even the drones and the presence of an international naval armada are unlikely to deter pirates, Moeller said. Pirates are "prepared to take their chances against the warships that are patrolling the area, simply because the potential for big financial gain is significant," he said. Cyrus Mody, an expert on piracy at the London branch of the International Maritime Bureau, said he expects the drones will help ward off attacks by acting as an early-warning system for tankers and other commercial vessels traversing waters off the Somali coast. "What we hope will happen is that they will get much earlier warning of suspicious vessels or suspected (pirate) mother ships that can then be targeted by the naval vessels. Or alerts and broadcasts can be sent out indicating the positions of these ships (and) indicating they should keep as clear a distance as possible," Mody said. U.S. Navy vessels have used 3-foot-long drones off the East Africa coast before. But the Reapers - which have a 66-foot wingspan - represent a significant investment by the U.S. military to gather intelligence in the region. Last spring, U.S. Navy sharpshooters killed three of the four pirates who were holding Richard Phillips, captain of the U.S.-flagged cargo ship the Maersk Alabama, hostage in a lifeboat. The drone deployment comes as piracy is on the rise in the area. While the bandits targeted 35 vessels in 2007 and 111 in 2008, they have launched some 178 attacks so far in 2009, according to International Maritime Bureau figures. The high-seas hijackings have persisted despite an international armada of warships deployed by the United States, the European Union, NATO, Japan, South Korea and China to patrol the region. In a sign that nations are being forced to step up security, Seychelles announced this week that it would send troops to its outer islands. A Seychelles minister, Joel Morgan, said the coast guard is working closely with international naval forces and that both the U.S. and Europe have maritime patrol aircraft stationed in the island nation. The Somali-based pirates operate freely in a country with no effective government and can earn millions of dollars by hijacking a ship that might contain oil, coal or other goods - a windfall for young, unemployed men. Moeller, the U.S. commander, said good governance, rule of law and economic development are all needed in Somalia so that pirates "have an alternative lifestyle to pursue. And unfortunately, that's not the case today." "The long-term solution to the piracy issue is basically getting the conditions right in Somalia," he said. Peter Chalk, an expert on piracy at the Washington-based RAND Corp., said he believed the new drones would be "largely irrelevant" in bringing an end to the lawlessness because problems with Somalia's government need to be addressed first. Otherwise, piracy will persist, he said. "The risks of being caught are very low (and even lower in terms of being successfully prosecuted) while the potential rewards are enormous - at least in a Somali context," Chalk wrote in an email. Pirates raked in up to $80 million in ransoms in 2008, Roger Middletown, a piracy expert at the London-based think-tank Chatham House, says. Tracing the cash has been difficult in part because of Somalia's chaotic civil war and partly because many Somalis use an informal clan-based money transfer system instead of normal banking channels. Analysts say the pirate attacks are criminal in nature and not part of Somalia's Islamic militancy or al Qaeda. The pirates try to keep their distance from such groups so the ransom payments don't get seized by terrorists. Surveillance gathered by the drones will augment other international investigations into pirate activity. Experts have been keen to trace the cash from ransoms, usually packed in a waterproof container and dropped by parachute into the sea, where it is picked up by pirates. Many worry about putting huge sums of cash in the hands of pirates who live in a country where al Qaeda operates. The U.S. military is stepping up efforts in the region to ensure that shipping lanes in the Indian Ocean and Gulf of Aden remain open, said Mark Schroeder, an Africa analyst at the global intelligence firm Stratfor. He said he believed the Reapers would also be used to track al Qaeda figures in Somalia. "They need to ensure nothing gets disrupted (at sea)," Schroeder said. "There is the ordinary commercial traffic that is significant (and) the U.S. and the other navies there don't want to see that blocked by Somali pirates."